I’ve started a new little endeavor recently, making jewelry from polymer clay. I’ve successfully created one respectable piece with a minimal amount of cursing. 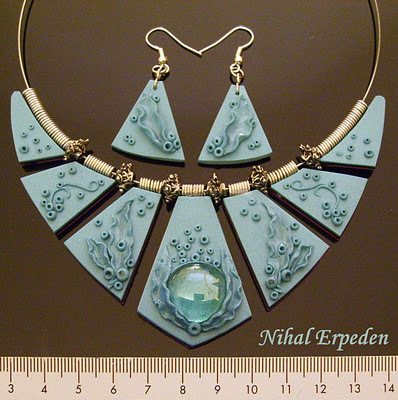 I love the range of polymer clay, how it can look like leather, glass, stone, wood, ceramic, whatever you can imagine. It’s a joy to work with a medium like that. Which brings me to today’s artist, Nihal Erpeden, whom I came across while I was looking for a little inspiration (hubris, really. There’s nothing I saw that I can even close to approximate), and I found this amazing jewelry artist. I love how she combines the free-form, organic detail on a surface so precise and geometric. It really is lovely, and anyone would be lucky to own such a piece.